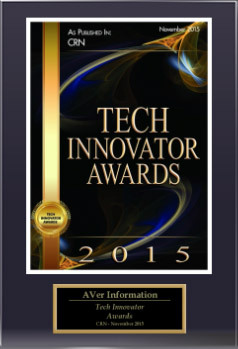 CRN magazine Innovator's Award recognizes AVer Information, Inc., leading provider of business and educational technology solutions for its intelligent charging locker AVerCharge L12i and video conferencing system VC520. CRN's Test Center's Tech Innovator Awards program examined products within 19 categories of IT and assessed each product based on its ability to increase productivity, save on cost and ease of use for solution providers, IT departments and end users. "Our mission is to provide innovative technology solutions that are affordable, efficient, and easy to use. We are honored to be recognized in two different categories and will continue to offer our channel partners with cutting-edge solutions,"
expresses Arthur Pait, President of AVer Information Inc. Americas. AVerCharge L12i is a small footprint charging solution packed with features to safely secure and efficiently charge devices. Its compact size makes it a cozy fit in even the most confined spaces, yet leaves room for additional device support. Unlike other cabinet solutions, L12i's stackable design and daisy-chain technology can accommodate multiple lockers connected together from a single outlet without the worry of overcharging or overloading devices or circuit. The sleek charging locker can comfortably support 12 laptops, Chromebooks, or tablets with its spacious slot width design. Ultimately, its intelligent charging feature makes it an energy and cost saving solution. The quality of the product is not only seen in the features, but also in the all-inclusive warranty program and unsurpassed customer service that is provided with the product. AVer's VC520 provide users with a professional quality USB, plug and play, and all-in-one video conferencing alternative to traditional and expensive video conferencing systems, without the firewall and support issues. VC520 provides true full duplex with AGC and noise suppression speakerphone with a 30' diameter microphone pick up range and ability to daisy-chain an additional speakerphone. At an unbeatable value, this USB video conferencing solution for mid-to-large conference rooms is priced under $1,000.00. VC520 offers a 3-year warranty with 1st Year Advanced Replacement guaranteeing a replacement unit within 72 hours at no additional cost.